The broad economic categories (BEC) classification provides data users with a new perspective on Canada's imports and exports. A key feature of the BEC classification is an end-use aggregating structure that is consistent with the three basic classes of goods in the System of National Accounts (SNA), namely capital goods, intermediate goods and consumption goods. This aggregating structure allows the analysis of external trade statistics with other economic data (such as industry statistics) and national economic account aggregates (such as gross domestic product). Imports and exports classified by broad economic categories provide insight into their role as inputs into production, as a source of capital and as a source of goods for final consumption. Annual data for Canadian international merchandise trade by BEC are now available in CANSIM table 228-0081 for the period from 2000 to 2016. Imports of intermediate goods accounted for 47.0% of total imports to Canada in 2016, down from 57.2% in 2000. Meanwhile, the share of imports of consumption goods rose from 15.1% in 2000 to 21.2% in 2016, while the share of imports of capital goods rose from 18.7% in 2000 to 20.3% in 2016. This highlights an important trend in Canadian imports—a move away from the import of intermediate goods towards capital and consumption goods. This could point to a changing role of Canadian business—away from 'assembler' and towards distributor. The reverse is true for exports. In 2016, 58.1% of exports were intermediate goods compared with 56.8% in 2000, while the share of capital goods declined from 14.6% in 2000 to 9.0% in 2016. By BEC category, processed industrial supplies (BEC 22), parts and accessories of transport equipment (BEC 53) were among the top three intermediate exports to and imports from the United States, while primary fuels and lubricants (BEC 31) had the second largest export value to the United States. In 2016, 71.6% of Canadian intermediate exports were destined for the United States, down from 83.1% in 2000. This compares with 5.3% bound for China, up from 1.4% in 2000, and 5.0% bound for the United Kingdom. In 2016, 56.5% of Canadian intermediate imports were sourced from the United States. This share decreased by 11.2 percentage points from 2000 to 2016. Imports of intermediate goods from China (8.2% of total intermediate goods) and Mexico (5.2%) accounted for 13.4% of total intermediate good imports in 2016. The share of imports of intermediate goods from China increased from 1.5% in 2000 to 8.2% in 2016, while Mexico's share rose from 2.6% to 5.2%. 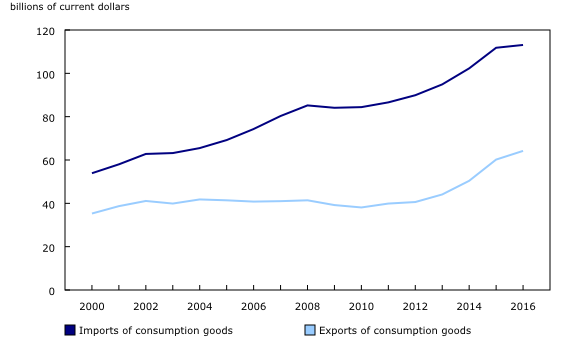 Canada consistently imported more consumption goods than it exported and the gap has been widening since 2000. 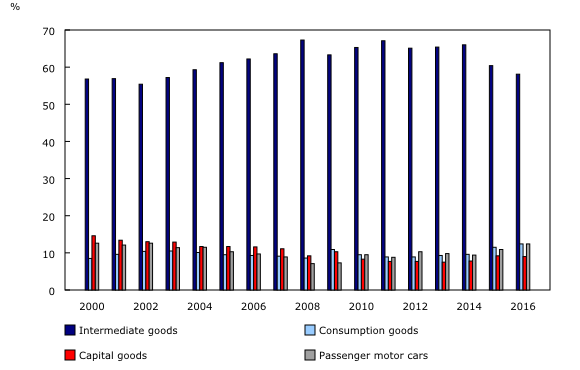 Imports of consumption goods have risen every year since 2000, with the exception of 2010. They reached $113.1 billion in 2016, more than doubling from 2000. Exports of consumption goods have also been growing since 2010, reaching $64.1 billion in 2016. In 2016, 41.2% of consumption good imports were sourced from the United States, followed by China (20.4%) and Mexico (4.9%). In 2016, 73.7% of consumption good exports were bound for the United States, while Japan (3.7%), China (3.5%) and India (1.8%) were other significant markets. China (+17.7%), India (+15.7%) and Italy (+13.9%) had the fastest growth rates from 2000 to 2016. 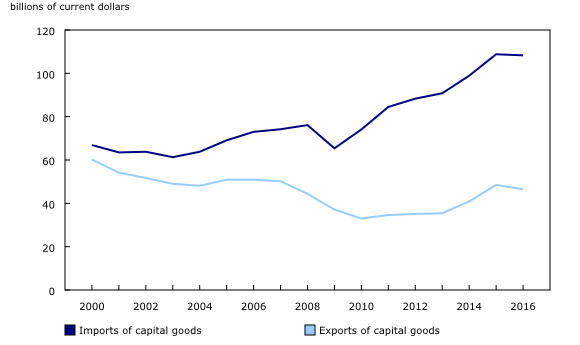 As with consumption goods, Canada is consistently a net importer of capital goods and the gap has widened since the 2009 recession. Imports of capital goods have been trending upwards since 2003 with the exception of 2009 and totalled $108.3 billion in 2016. By comparison, exports of capital goods, at $46.5 billion in 2016, were well below their 2000 level. As a consequence, the growth rate of imports (+3.1%) outpaced that of exports in capital goods (-1.6%) by a wide margin from 2000 to 2016. In 2016, 48.2% of imports in capital goods mostly originated from the United States, followed by China (19.0%) and Mexico (8.8%). China's share of imports has increased more than 10 fold in 16 years. In 2016, 72.5% of capital goods exports were destined for the United States, followed by China (2.9%) and the United Kingdom (2.5%). 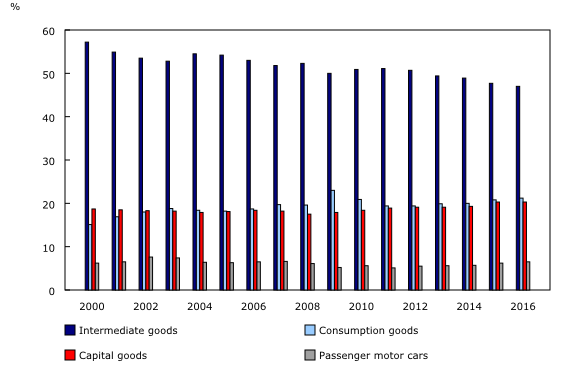 Malta was the fourth-largest destination of capital goods exports, mainly aircrafts. While the United States was the largest destination, exports nonetheless declined by an average of 2.8% from 2000 to 2016. The document "Canada's external trade classified by Broad Economic Categories," which is part of Latest Developments in the Canadian Economic Accounts (Catalogue number13-605-X), is now available. To enquire about the concepts, methods or data quality of this release, contact Jean Bosco Sabuhoro (613 818-9151), International Accounts and Trade Division.